The effects of the Solar Eclipse of May 2012 on geopolitical events and on the financial markets are thoroughly illustrated and discussed in this fascinating book. LAST FOR MONTHS TO COME! 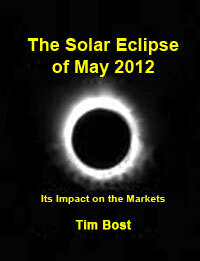 This hard-hitting special research report from Tim Bost reveals all the key information you need on the dramatic effects of the solar eclipse of May 20, 2012. Once again, Tim's world-famous wisdom in financial astrology brings you unique insights that you simply won't find anywhere else. With the incredible information you'll find in these pages, you'll be ready to turn tomorrow's market moves into profitable opportunities! This exciting new report is ready for instant download now. The solar eclipse on May 20, 2012 was much more than a one-day event. It set up a resonant field that has an enduring impact on geopolitics, economic trends, and price movements in stocks, commodities, and the financial markets. That's why this book is such a valuable money-making resource-- it's packed with profitable information you can use in the markets long after the eclipse itself! a $700 gift for you - and much, more more! The creation of an international commercial monopoly. A major breakthrough in communications technology. The spread of a bogus vaccine that paralyzed hundreds of people. Religious disagreements that lasted for five decades. Programs for raising taxes and increasing public assistance. The destruction of a national treasure. Big layoffs by blue chip manufacturers. The construction of the tallest building on an entire continent. A push to get rid of a central bank. A global collapse in oil prices. The origins of commercial junk bonds and consumer credit cards. The creation of an artistic masterpiece by a scientific genius. The unveiling of an international money-lending conspiracy. New restrictions on labor unions. Major milestones in modern marketing. A massive foreign aid program. The founding of the Knights Templar-- and the war meant to destroy them! A record year for mergers and acquisitions. Government-sponsored book burning in the U.S.A. Terrorist bombings and violent attacks against religious groups. A financial collapse that sent unscrupulous bankers to jail. Plunging interest rates and rising stock prices. What this solar eclipse means for key countries in Asia, the Pacific, and the Middle East. How you can get in on the action at Native American casinos. The potential eclipse impact on the stock market and the stability of the U.S. dollar. The big money behind large-scale social and governmental realignments. How to be play a role in making money with designer watches. The astonishing winning track record that comes with using eclipses. Connecting with a high-profit part of the movie industry. A South American opportunity in the oil business. The potential for armed conflict in a part of the world that's been relatively quiet until now. Specific eclipse trading strategies and opportunities in the coming months and years. While this book is loaded with astrological expertise, you don't have to be an astrologer yourself to gain the astro-trading advantage it offers. As the editor of FinancialCyclesWeekly newsletter and a sought-after expert on planetary market timing, Tim Bost knows what it takes to turn highly specialized knowledge and turn it into workable trading plans and strategies for you!